In this coop tour, Jess from the Remote Customer Service Team shows us her summer coop set up, how she deals with the challenges of their location, and how she protects her chickens and ducks from predators. Jess’s farm is at the highest elevation in her county so she gets very high winds. 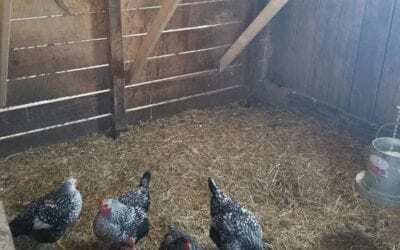 To make sure her coops are stable in the high winds, she chose low profile prefabricated coop designs and reinforced them with plywood and by gluing the seams in addition to adding bars and posts to the corners to help anchor the coops. Jess has added extra D-rings and latches to the coop doors to make sure raccoons can’t open them with their extra dexterous fingers. The runs are made with very thick gauge chicken wire, even doubled in some areas, and includes wire buried around the perimeter of the coop. Jess says that letting the grass grow around the perimeter also prevents predators from digging and gives the chickens more things to scratch and peck at. The run base is a mixture of soil, sand, wood chips, with added diatomaceous earth and a coop refresher product. Jess turns mix every other month and uses the ground cover as compost in the garden the next year. The summers are very humid so the open runs and windows on the coop help with ventilation to keep the humidity inside the coops low. Jess lives in the snow belt and gets tons of snow in the winter, so she has a winter coop set up in the lean-to of the barn where she has electric hookup. One of the best ways to prevent predators from coming around your coop is making sure there is no food waste for the predators to scavenge. 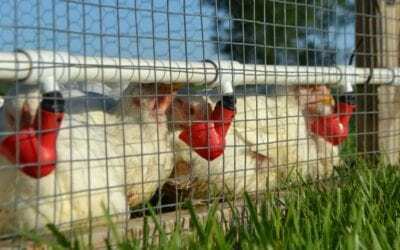 Jess uses PVC pipe feeders and waterers to reduce wasted food inside the coop. She uses a tray to feed her flock treats and then removes the tray from the coop every night so nothing is left in the coop. Jess wants her ducks to live at the pond but currently has them in their own coop near the chickens because of the predators and she says the ducks are scared of the pond. She says she rarely if ever has any signs of predators bothering the ducks, possibly because of their size and they make more noise than the chickens. To further protect her flock, Jess only lets them out of their secure runs to free range when either she or her husband is home to supervise. The flock is safely locked up in their coop every night. What kind of challenges do you face for your coop with your location? How do you protect your flock from predators? When building a chicken coop, the hardest and most expensive part is usually building the structure itself. The size of the coop, location, materials available, and your budget all need to be taken into consideration when building a new coop. When converting a horse stall into a chicken coop, this hard part is mostly all already done! 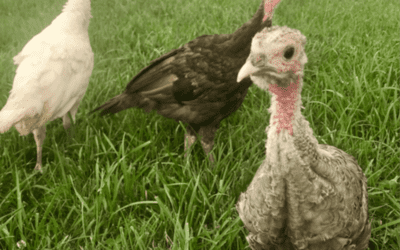 In this coop tour, Amanda and Sarah from the Customer Service Remote Team are at Sarah’s farm to show you their new heritage turkey poults and give you a tour of Sarah’s coops. Marie raises her Cornish cross meat birds in this chicken tractor set up. She raises 8 batches a year of 25 birds at a time, and this year she is trying all females instead of a straight run mix. So far she has noticed that the females tend to be less pushy at feeding time than the males.